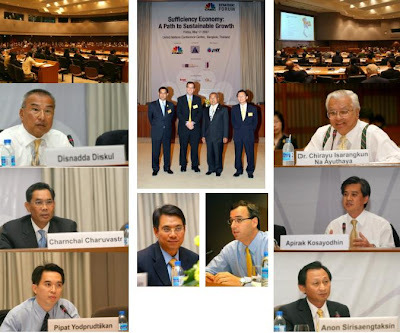 Bangkok, 11 May 2007 - CNBC, First in Business Worldwide, with main sponsors, PTT Group, TCEB and Siam Commercial Bank is organizing a CNBC Strategic Forum, “Sufficiency Economy in Thailand,” on May 11, 2007 at the UN Conference Center, in Bangkok, Thailand. After the 1997 East Asian financial crisis, His Majesty, Bhumibol Adulyadej, the King of Thailand, honored the royal philosophy of Sufficiency Economy, which is about having moderation, reasonableness as well as self-immunity from the impact of internal and external changes. In order to achieve this, application of knowledge has to be handled with due consideration and prudence. It is also important to maximize utilization of theories and methodologies when planning and implementing policies. This philosophy was developed, not only to create a greater awareness of the country’s economic vulnerability but to also help the people of Thailand develop a guiding principle for a more comfortable future. It stresses on the morality of the nation, particularly public officials, academics and businessmen, adhering first and foremost to the principles of honesty and integrity. The implementation of Sufficiency Economy principles will alleviate poverty. Communities that act as foundations for the local economy will also be empowered. Additionally, there will be an increase in corporate responsibility and standards of governance. Besides that, the country will be immune from future shocks and will make way for greater amount of equitable and sustainable growth. The CNBC Strategic Forum - Sufficiency Economy in Thailand looks to bring together industry experts, consultants as well as business leaders, to discuss the fundamental components that are paramount to creating a stable, transparent and sustainable economic environment. Some of the topics of discussion include the key challenges towards sufficiency of economy in Thailand and the impact it has made since the 1997 financial crisis. “The Board of Directors believe in promoting corporate governance for corporations in Thailand to achieve international recognition and acceptance,” says Mr. Charnchai Charuvastr, President and CEO of the Thai IOD. ”One of the many Thai IOD objectives is to encourage Thai companies to be good corporate citizens and contribute to the country's sustainable growth and prosperity." Speakers include: Dr. Pipat Yodprudtikan, Director, Thai Pat Institute, M.R. Disnadda Diskul, Secretary General, Mae Fah Luang Foundation, Mr. Charnchai Charuvastr, President & CEO , IOD Thailand, Mr. Apirak Dosayodhin, Bangkok Governor ( TBC ), Mr. Anon Sirisaengtaksin,Senior Executive Vice President, Corporate Strategy & Development, PTT PLC Mr. Roongrote Rangsiyopash, Vice President and CFO, SCG PCL. ,with Mr. Jeremy Pink, President & Managing Director - CNBC Asia Pacific moderating.